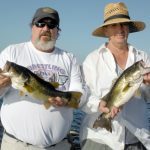 www.okeechobeejust4bass.com was fishing with Kirk Snader and his brother Allen on Lake Okeechobee on Monday. It was a 4 hour trip with shiners and we caught 12 fish. The winds where blowing 10-15 mph out of the NE. Here is a picture of some of the fish they caught.